This novel has the look and feel of a classic, and indeed the cover claims it to be 'A modern classic with the charm of Little Women and the wit of Anne of Green Gables'. I won't make any judgement myself as to whether it matches up to the reputations of those two novels, it's been far too many years since I read them both, but I loved pretty much every minute of the time I spent, including a couple of rather late nights, absorbing the story of 14-year-old Joan Skraggs aka Janet Lovelace. Set in 1911 and told in the form of a journal, thanks to the gift of a book from her teacher - a parting gift as Joan's father has decreed that she doesn't need school any more as she is needed to work on the farm, cooking, cleaning, gardening, chicken-keeping, and whatever else is required of the only female on Steeple Farm. It's a very brutal life and her father doesn't show her an iota of kindness, rather telling her how ugly and hopeless she is, and that certainly no-one will ever marry her. She remembers her mother, who died when she was a child, telling her she was smart enough to be a teacher one day, but that's not the future her father has planned for her. Thank goodness for books and learning to read as they lead her to first plan a strike in protest at not having any money of her own, and then to run away to Baltimore, thanks to the money her mother secreted away in the clothes she made for Joan's doll. In a rather unrealistic series of events she winds up in the home of a well-off Jewish family (Joan is Catholic) who take her on as a 'hired girl' ie: someone to help with all and sundry household chores. She tells them she is 18 and invents her new name - Janet Lovelace. She reveals all in her diary entries, from the everyday life she leads - and I've always loved reading the domestic details that give you a real picture of someone's ordinary life, to her yearning for lovely things and friends to enjoy life with. The Baltimore household is far more advanced than Steeple Farm, here there are electric lights and carpet sweepers, and the delights to be bought at the family's department store. She comes undone fairly frequently due to her romantic flights of fancy, and is often scolded by the lady of the house, but she also receives great kindness and the facility to improve herself. She reads every night in the library, but worries over wanting to read thrilling romances rather than philosophy. She attends mass and takes religious instruction from the priest, but then takes a day of pleasure instead, experiencing the opera and other things she'd never dreamed of. Janet/Joan is easy to like, and to despair over as her youth and inexperience, and her exuberant personality get her in trouble again and again. But all is well and I loved how the story resolved it. I had expected more trouble from the family she left behind, but she never receives any demands to return or unwelcome visits from her father or brothers. The hurdles she has to face are mainly because of her own feelings and impulsiveness rather than anyone causing her problems. I really enjoyed building the picture of the life of this whole household in a time of great change in this American city, and also learning about the Jewish faith and customs that are thoroughly documented here. 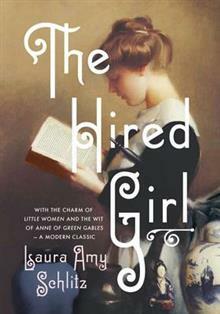 I'll recommend it to my intermediate school girls and above for a thoroughly enjoyable read.